Taste of BBQ Festival – formerly known as Alive! 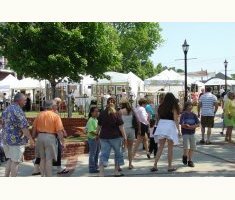 Festival, is a family friendly event that takes place in Suwanee annually. The Taste of BBQ Festival will take place on Saturday, October 12th from 10am to 6pm. This is a community family festival featuring a Taste of BBQ, LIVE Music plus Local Vendors, an Artist Market and a Family Fun Zone with activities for children of all ages. The Taste of BBQ sample tickets will be sold onsite, each are $1 – with samples from vendors being between 1 to 5 tickets each. The Taste of BBQ Festival is a fundraiser for Project Green, a local kids non-profit and is free to attend for all. Our live music & entertainment is sponsored by ARN - All Right Now Entertainment featuring local Atlanta based artists.